After the searing heat of the Sonning match earlier in the week, conditions were cloudy and thankfully cooler for this home clash with Peppard. The visitors won the toss and elected to bat first. Reading’s strong opening attach of Gaajuran and Ashwyn bowled with pace and accuracy always keeping Peppard under pressure. Ashwyn had the Peppard opener bowled early to leave Peppard 5-1. Connor and Nick from Peppard started to build a useful stand in recovery but always found runs hard to come by. Good bowling by Raheel, Sam, Aarav, Ajmal and Matthew backed up by excellent fielding kept the run rate down. Henry notably made a number of excellent stops behind the stumps. 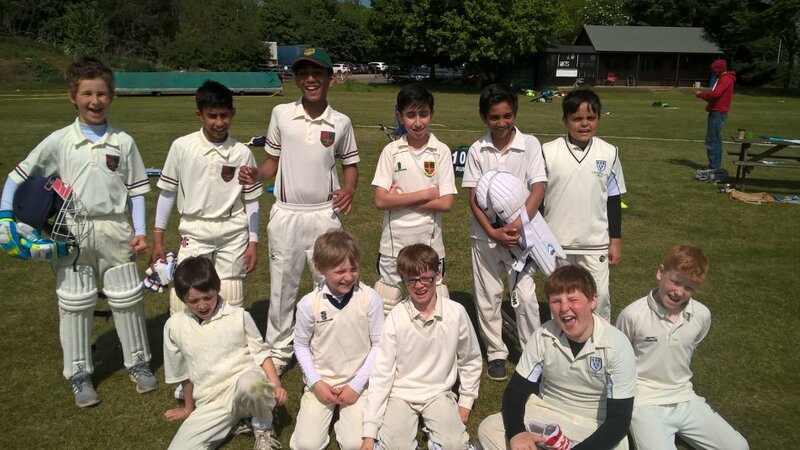 Sam was also outstanding in the field earning 2 run outs with excellent throws as well as taking a good catch off Aarav’s bowling. Matthew, and Nathan kept the bowling tight with Nathan having a Peppard batsman out bowled. Jibran also did well in the final over to restrict Peppard to just 4 runs to leave them on a total of 70-4. Reading replied confidently with an opening stand of 46 before Raheel was bowled by Connor for 12. Aarav continued his fine form with 25 runs to be retired not out again. He is yet to be out this season and has scored more than 100 runs. Ezra offered good support, running well to finish 4 not out. Nathan was unlucky to be caught, which brought Gaajuran to the crease. He continued his excellent form (averaging over 100 this year) hitting a quick fire 13 not out including 2 fours to see Reading reach their target with almost 4 overs left. Well done on another good all-round performance to defeat a good Peppard team who are one of our rivals near the top of the table. Well done to all the boys, and special thanks goes to Ben Sandiford for scoring, and Dave Allen for umpiring. Peppard Stoke Row won the toss and decided to bat.